NGINX PLUS, delivering enterprise class features and more..
NGINX Plus is a web server with high performance load balancing and content cache designed for modern web sites, applications and microservices – lightweight, easily configured and fast. NGINX Plus has exclusive enterprise‑grade features beyond what’s available in the open source offering, including session persistence, configuration via API, and active health checks. 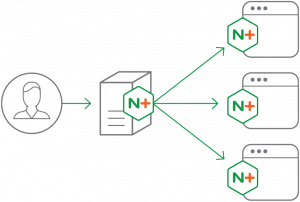 By using NGINX Plus instead of your hardware load balancer you can get the freedom to innovate without being constrained by infrastructure. Our hands-on technical workshop will introduce you to NGINX open source and NGINX Plus solutions. Attendees with be provided with a free developer license for NGINX Plus, for our workshop and their own private use. During the workshop attendees will be provided with a hosted VM to use, pre-installed with a standard web application e.g. digital ocean with WordPress. Re-run attack tools, have we improved the availability of the app? We will provide the VMs and set up a special interest slack channel to share keys, files and configuration. Registration is now closed for our NGINX Plus Technical Workshop – If you would like to join the waiting list, please register here. More Information available on our website, please visit our page Microservices reducing complexity or contact Roz Baird on 01-4064600. Solution Architects/Software Developers/DevOps//Program Managers: Interested in increasing agility by leveraging NGINX platform to modernize legacy, monolithic applications as well as deliver new, microservices-based applications and accelerate the online user experience. CIOs/ IT Directors/Managers: Interested in enabling high performance web architectures and improving user experience, without incurring unnecessary costs in capital or time. The Spencer Hotel Dublin is located in Excise Walk, IFSC, Dublin 1. It is easily accessible by bus, car or train. Location map for The Spencer Hotel. By Luas: The Spencer Hotel is located a 2 minute walk from the Luas red line, on the Mayor Square – NCI Luas stop with the Luas arriving approx every 10 mins during peak times. There are two main lines for the Luas, the red line and the green line. The red line, which is located very close to The Spencer, services stops such as Abbey Street, Four Courts, Smithfield, and Heuston Station, then continues on to Red Cow and then either Saggart or Tallaght. The stops for the green line include Ranelagh, Dundrum, Sandyford, Leopardstown and Cherrywood. More details on the Luas timetable and journey are available on the official Luas website. By Car: Once you have arrived at The Spencer Hotel you can park your car in our secure underground carpark. NGINX is the heart of the modern web. The world’s most innovative companies — from Airbnb to Netflix to Uber — have chosen NGINX to deliver their apps to the world, and NGINX now power half of the world’s busiest sites and applications. Why has NGINX become the foundation of so many applications? NGINX helps businesses deliver their apps with performance, reliability, security, and scale through our complete application delivery platform, NGINX Plus: combining load balancing, content caching, web serving, security controls, and monitoring in one easy to use software package. NGINX Plus ensures maximum speed and uptime for almost any application — whether a legacy application, traditional web apps, or interconnected microservices — and equally for all types of infrastructure (including bare metal, the cloud, or in containers). The flexibility and control NGINX Plus provides means every technical team can benefit, both now and as your needs change and grow. Achieve flawless application delivery today with NGINX. Sabeo is the largest and longest established Open source provider in Ireland. We provide a full range of Open Source platforms and solutions to meet the most demanding business requirements. As the first and largest Red Hat Enterprise Linux partner in Ireland, we have extensive expertise in all major Linux Distributions and are the only Red Hat Premier Business Partner in Ireland. Our Open Source team typically engage in the first instance at planning stages to help assess Open Source and the underlying technologies in line with customer imperatives, budget and existing enterprise architecture and investment. NGINX products complement and expand the leading CSP service offering from Sabeo which is built around the Red Hat OpenShift PaaS offering. These integrated NGINX products enable clients building out a microservices strategy, to optimise throughput and deliver exceptional performance across a fully distributed microservices architecture in a highly efficient, secure and cost effective manner. Copyright © 2018 Sabeo. All rights reserved.